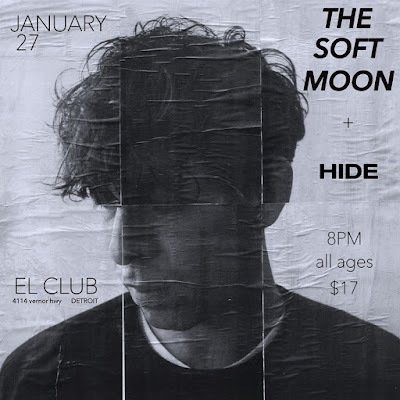 Sunday night, The Soft Moon will perform live at El Club in Detroit. The post-punk project headed by Luis Vasquez is currently out on a North American tour with HIDE. The tour kicked off in Brooklyn a couple of weeks ago and will take the two bands throughout the east coast, into the south and midwest, and even into Canada all in a matter of a few weeks. Give The Soft Moon's latest album Criminal a listen below to get ready for Sunday's show. Tickets for Sunday's show are $15 in advance or $17 at the door. You can purchase your tickets in advance here. You can also enter to win a pair of tickets to the show by sending your name to hipindetroit@gmail.com with #moon in the subject line. We will draw one lucky winner on Sunday morning and send them details on how to claim their prize. Lingua Ignota will also be joining The Soft Moon and HIDE for Sunday's show. Doors are set to open at 8 p.m. for this one and the show will kick off at 9.